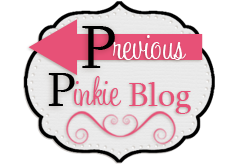 We're so glad you could join us on our Pinkies Blog Hop. We'll be showcasing lots of gorgeous projects using products from the new Stampin' Up® Annual Catalogue. Simply use the buttons at the end of each post to keep on hopping. We love comments, so please do tell us what you think! If you have arrived here from Nicole's beautiful blog, a big hello and welcome to you. It's difficult to know where to start as there are so many lovely new sets in the catalogue. 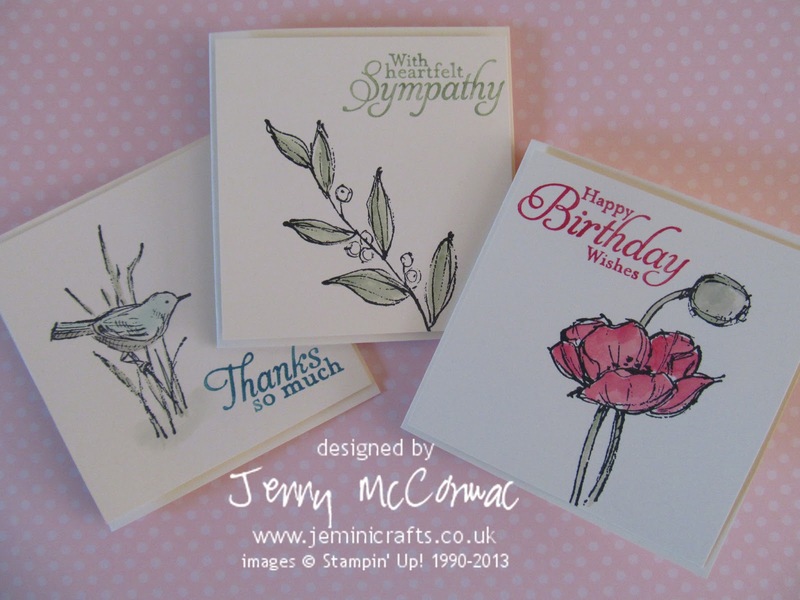 I decided to use a hostess set called 'Simply Sketched' as I just adore the three sweet images and the three sentiments which can all be mixed and matched. Although this is a stamp set exclusively for anyone hosting a party, or placing an order over £150, you can also get this stamp set for FREE when you join one of my craft clubs. Click on the link at the top of this page fore more details on how to join. For simplicity I used very vanilla cardstock for the card base, with an additional slightly smaller layer which I stamped directly onto. 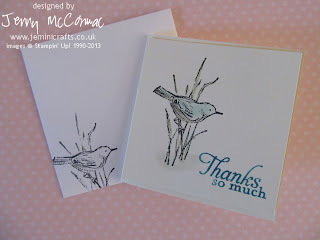 I utilised Staz-On Black ink for the images, and our Stampin' Write Marker Pens which I scribbled onto an acrylic block. I then used our Aqua painter to pick up the ink from the block and fill in the colour on the cards. My favourite image is probably the little bird, and I stamped the sentiments using the same colour ink as I have used for colouring the image. These little note cards (you can get 4 from an A4 sheet), match perfectly with our mini envelopes, and as you can see I stamped those too with part of the image. 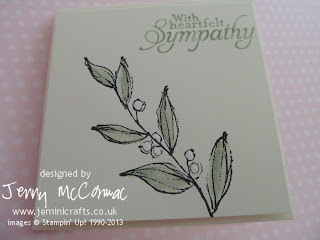 Here is a close up of the Sympathy card. It is quite difficult to photograph in the current light conditions, but the berries have been highlighted with some White Signo Gel pen to make them stand out. I made a little gift box to put all three cards and envelopes into - I used our lovely Natural Composition Specialty Card for the base and top, cutting out a circle and adhering a stunning piece of clear window sheet from our Designer Series Paper called Quatrefancy Specialty. 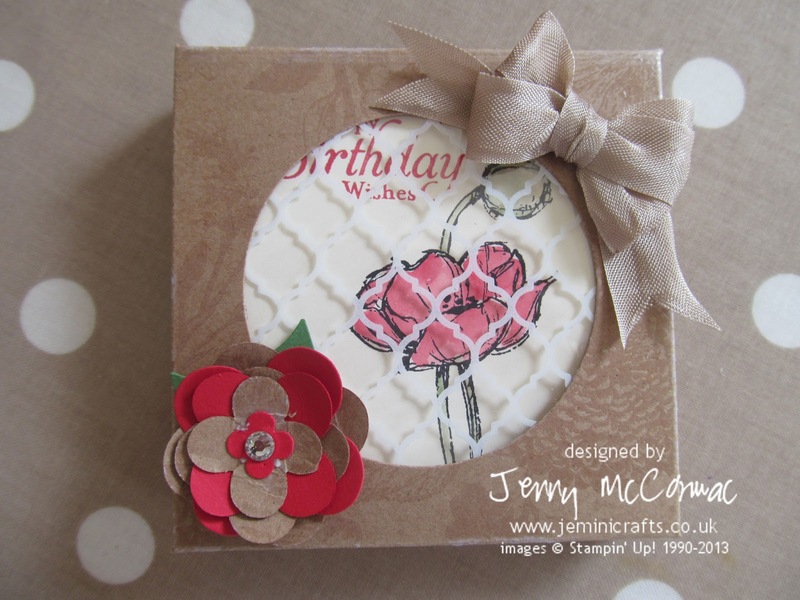 These boxes are so easy to make with our Simply Scored Tool (p78) and I have finished the box off with some lovely Seam Binding ribbon (Crumb Cake) and a flower made using the Floral Fusion Sizzlet die, finished with a decorative Rhinestone in the centre. I hope you have enjoyed my projects today. If you have any enquiries, would like to order products or would like to find out more about Stampin' Up!, joining my team, a club or a class, then please do not hesitate to contact me. 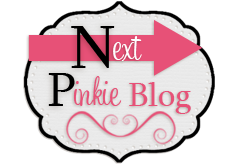 Now I will pass you onto the lovely Christa for the next Pinkies Blog Hop. Love this set you made! 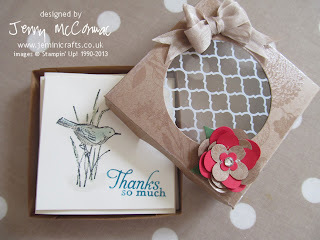 That stampset is really topping my wishlist...great idea to use it this way! This look realy nice... love the stampingset you used! What an elegant set of cards. So beautifully clean and simple. 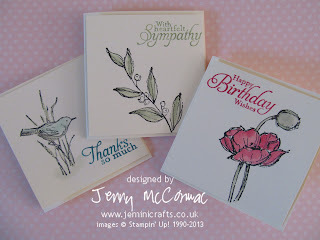 I'm a fan of little note cards and I really like how you used the stamp set with the cards. I like the cards you have made, the one with the little birdie is my favo tooo.